A photo captures the famed Notre Dame cathedral on fire. Smoke billows from the Notre Dame cathedral in the distance. Birds fly away from the Notre Dame cathedral as flames reach the rooftop. A photo from Aleks Maksimovic captures smoke billowing from the Notre Dame cathedral. Cameron Mitchell told CNN: "My roommate told me to come see it. I'm not sure when it started. I'm really not sure what to think. It's tremendously sad to see this happening to such an iconic monument. The fire has been slowly spreading across the roof. 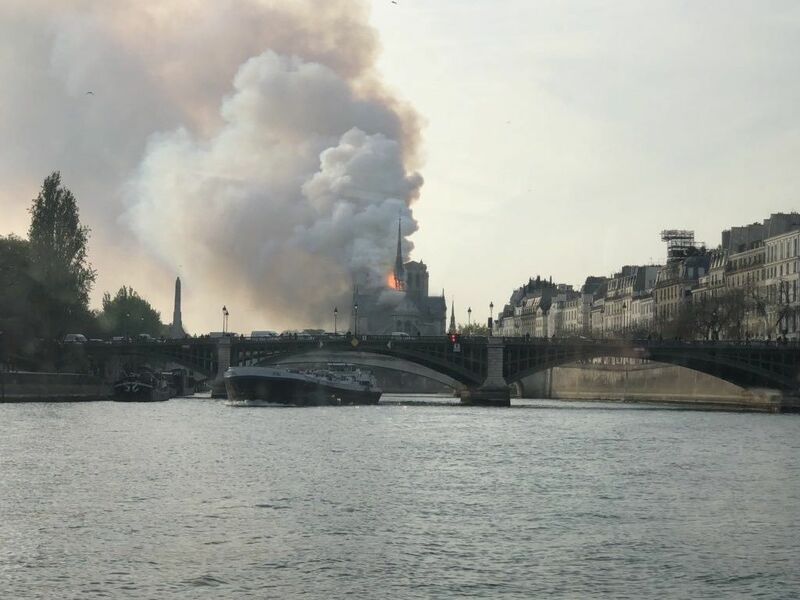 I'm really not sure what to make of this yet"
Flames knock the Notre Dame cathedral's tower to the side. The spire atop the iconic Notre Dame cathedral collapsed amid a devastating fire at the Paris cathedral on Monday. Images and video showed flames and thick plumes of smoke billowing up and around the spire, which is surrounded by scaffolding. Video showed the flaming spire lean to one side and then collapse amid the smoke. The fire rapidly spread and took over the iconic cathedral as onlookers scrambled to get a view of the destruction, even as soot and cinder fell onto them. Firefighters atop cherry picker cranes sprayed water onto the church in an attempt to calm the flames. Seven or eight firetrucks were trying to tackle the flames and the smell of smoke emanated through the air. The firetrucks were having difficulty getting to the scene amid the daily afternoon rush hour. Police said on Twitter the public should avoid the area and allow emergency vehicles into the scene. French Interior Minister Christophe Castaner said exceptional measures are being taken to try to save Notre Dame Cathedral. 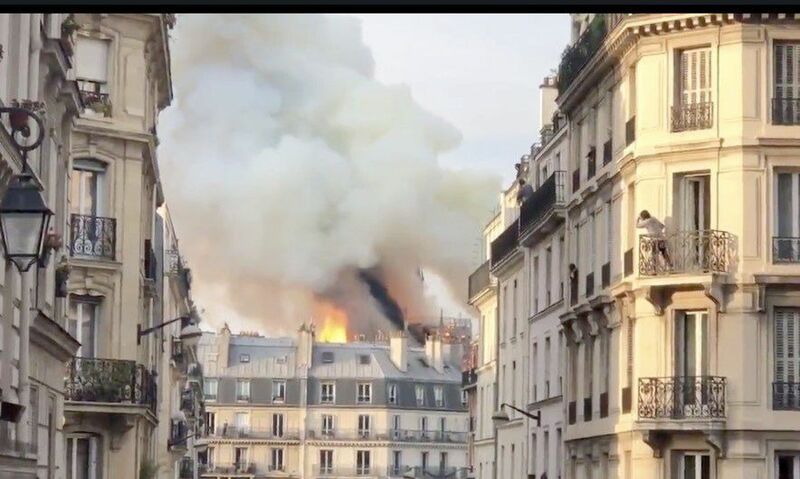 Paris Mayor Anne Hidalgo said the fire brigade is trying to control a "terrible fire" that broke out at the cathedral. "A terrible fire is underway at Notre Dame Cathedral in Paris," Hidalgo said. "The fire brigade are trying to control the fire. We are mobilized locally in close connection with church authorities. I ask everyone to respect the security perimeter." Located in Île de la Cité, a small island in the middle of the city, the cathedral is one of Paris' most popular attractions, drawing an estimated 13 million visitors a year. The central spire was built in the 19th century amid a broad restoration effort, partly buoyed by the success of Victor Hugo's novel "The Hunchback of Notre-Dame" in 1831. It was not immediately known what caused the fire and whether anybody was injured. The cathedral has been surrounded by scaffolding and was under construction. French President Emmanuel Macron postponed a planned speech Monday night because of the Notre Dame fire, a spokesperson for the Elysee Palace says. "Notre Dame of Paris in flames. Emotion for a whole nation. Thoughts for all Catholics and for all French. Like all our countrymen, I'm sad tonight to see this part of us burn," Macron said on Twitter. CNN's Saskya Vandoorne, Eliot McLaughlin and Gianluca Mezzofiore contributed to this report.